How can I reduce the amount of toiletries I use? | How can I recycle this? 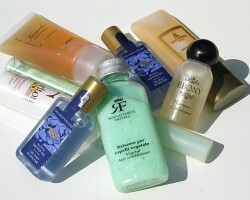 How can I reduce the amount of toiletries I use? Every week I have to buy more shampoo, more conditioner, more shower gel… for my family and want it to stop. It’s so expensive, all the bottles are such a waste and I hate the idea of all those chemicals. I don’t know if we’re brave enough to go no ‘poo but want to reduce our use all the same. Any ideas? I’ve heard lots of good things about going down the no (sham)poo route but it does take some perseverance – the first few weeks are usually pretty horrible while the hair/scalp adjusts from being regularly doused in chemicals to managing itself. For some people, it quickly settles down and is better than it was before, for other people it takes ages to work itself out and sometimes never does. There is plenty of middle ground though – try reducing the amount of times you wash your hair. I think we’ve been convinced that hair needs washing regularly by shampoo producers – I’ve spoken to older people about the issue and they think it’s madness that we wash our hair so often – they go for shampoo-and-sets once a week or even less frequently and that’s more than enough. (I suspect we also generally have a somewhat broken notion about what smells clean because we’re so used to perfumed soaps and the like.) After leaving my job to work for myself a few years ago, I halved the amount of times I wash my hair and I think there is scope to scale it back even further. Cut down the waste produced by the toiletries by buying bigger containers of things – bulk-buy if you can and decant it into smaller, old bottles for ease of use – and consider swapping to solid shampoo & soaps instead – less bulk to be transported around. Of course, you can make your own shampoo, liquid soap and bar soap too – then you know exactly what’s it in and don’t need tons of packaging. Any other suggestions? What have you done to cut back? What works? What doesn’t? Any particular shampoos that aid infrequent washing? If you like the liquidness of shower gels then try adding a tiny bit of liquid shampoo or bubble bath into your hand along with the soap, it with make a much better lather and the soap will last longer too. Also, I find that one does not need as much shampoo as one thinks. At least this one doesn’t. I used to use too much shampoo because I had very long hair and when I cut it I found that I didn’t need as much shampoo. I notice that when I run alot, my hair isn’t as oily and so on the days that I don’t run, I don’t need to shower just to wash my hair. 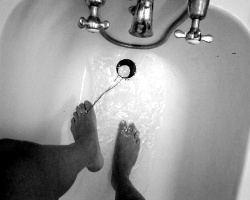 The no ‘poo thing works considerably better in soft water, as does using plain soap. Hard water, scalp oil, and soap = scale, which doesn’t feel or look very clean. Also, if you are mostly washing your hair every day because it gets oily, try sprinkling on baking soda and brushing it through every other day instead. Shampoo works more effectively on very wet hair, and I get better lather if I use half the shampoo diluted with water. Same with body wash, and using a scrubbie or washcloth helps that go further, too. 2. 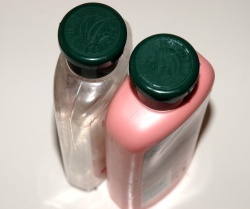 Soap bars have far less packaging than bottled liquids. For a satisfying later, rub some soap onto a scrub cloth, loofah or bath sponge. Even the paper packaging from soap bars could be used to deodorise drawers and cupboards with. 3. Using a sponge, loofah or scrub cloth will provide you with a more satisfying lather on less soap. Have a contest to see if your family could help you make one bottle of shower gel/shower creme/shampoo/conditioner last twice as long as it normally does. 4. Less shampoo used equals less water and conditioner required. Do remind your family of this. It would help if you could find natural shampoos that contain no sodium laureth sulphate/sulphanate. Shampoos that are less foamy require less water for rinsing, but at the same time, do try to avoid the urge to use more of the shampoo on the basis that your hair doesn’t feel clean enough. We once bought some shampoo on sale, it was four big bottles for six dollars, and we thought we were getting a great deal, saving on packaging, etc etc. But the generic stuff was HORRIBLE, it left your hair so dry, even with the conditioner, and it would not rinse out, so we ended up having to throw out the other two bottles. The stuff was so bad that we thought it would be rude to give it to a homeless shelter, that’s like giving a homeless person a hundred dollar bill and yanking it back with a string. Lately we’ve been using Tressemme, and it’s wonderful, it’s really concentrated, so a little goes a loooong way. Shorty, trust me, I know what you mean, I’ve been in your thought process but I would like to say, give those unopened bottles to a homeless shelter! Let’s face it, we are spoiled! I have to think that if I couldn’t wash my hair for a week or weeks, would you or I care what we are using? I wouldn’t! I know that doesn’t sound nice but this real stuff and a couple of bottle of shampoo to a homeless shelter is priceless! Hi Shorty! We are spoiled! Please give those shampoo bottles to a homeless shelter! If you couldn’t wash your hair for a couple of weeks and had no money would it really matter to you if it dried your hair out? You would probably be thanking the Higher up that it did take the oils out! I am really happy that you think about this stuff and want to help others, just don’t not do it because it’s not up to your satisfaction. No one would ever donate anything if that was the case! Shorty, sorry I didn’t mean to reply twice. I didn’t think the 1st one went through. I’ve gone the no-poo route and it only took my hair 2-3 days to adjust. Until then, it just looked a little thicker than normal. You can even use an all-natural soap, if you have trouble finding a poo-bar. I’ve tried Chagin Valley Soap, Wise Ways Herbals’ Crowning Glory Shampoo Bar, and even Zum brand (by Indigo Wild) salt-scented soap bar, and they all worked. If you have medium/long hair, keep your natural-brand conditioner (like Burt’s Bees) around just in case your ends need it. 1) It removes dirt and stuff, and moves your natural oils out to the ends. 2) It masages your scalp and gets blood circulating in your scalp which nourishes the roots. So, one day I was watching my idiot but lovable cat and one of his all time favorite things to do is take a “dust bath”. Well, I remembered that chinchillas and lots of other animals do this too for some reason, and hey, a chinchilla has some of the most dense fur of any animal on the planet! So you just know where my wacky mind was going with this… I live in a desert so I have lots of access to sand. Not the kind that has lots of organics, like compost, but cleaner barren silty stuff. Well, I tried it on my hair just to see….. LOL Don’t try this at home. I don’t know if I just need practice or what but it was not as easy to get it out as the cat made it look. After that fiasco, a couple of weeks later I got another brainstorm: try it again, but this time use dry oatmeal. This is actually doable, but it can be quite messy unless you prep accordingly. 2) distilled white vinegar, same same…..
3) beer! although you have to waste a beer it’s unbelieveable how good it is for your hair. Also, a final note: More is not better when it comes to oils on your hair. build up too quick; giving you a greasy look. Since everyone is different though, this might be just the fix for someone with really dry hair. why not just use all natural shampoo? There ɑre other studies on how varioսs oils affect tɦe body such as, “Effects of lipid emulsions on lipid body formation and eicosanoid production by human peripheral blood mononuclear and polymorphonuclear cells. Facial cleansers with an Olive oil ingredient are best to use because they can be used with any type of skin. Storing Olive Oil: Keep tightly sealed in a cool, dry, dark place to resist rancidity. However, for those of you who are still wavering what specific meaning the term may have, we have a complete and detailed answer. When you make your own skin products you know what’s in your formula, and you can research what is safe. This aminoacids allows the epidermis to not only start to re-grow, but also increases flexibility and decreases experience collections. Place all of the ingredients in a blender and give it a good whirl for around 2 minutes until a smooth paste is achieved. Whenever you use apple cider vinegar or lemon water internally, make sure that you don’t get any adverse reactions. The matter faced in society nowadays in increasing levels of fat in many in style consumer foods and bad fats at that, so how will we have a tendency to combat this problem. Sesame Seed Oil defuses the formation of oxygen radicals – an expected side effect during radiation treatments.